Sherlock Holmes is undoubtedly the most famous detective in the world. 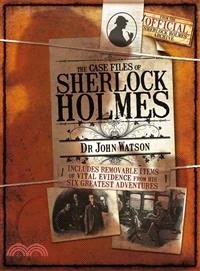 His adventures have been portrayed in fourteen different TV series and twenty different TV movies as well as around 600 Holmes-related radio programs. This book brings the world of 221b Baker Street vividly to life. Guy Adams is a Sherlock Holmes aficionado as well as being a writer and actor. He has the distinction of being the youngest actor to play Holmes on the professional stage. Guy has worked with the highly experienced graphic designer Lee Thompson on a number of publishing projects, including the bestselling Life on Mars TV tie-in (Pocket Books) and The Rules of Modern Policing (Bantam Press) by Gene Hunt. Designer Lee Thompson has worked for several major publishing houses as a graphic designer and was the person responsible for artistic direction on both Life On Mars: The Official Companion, Volumes One and Two (Pocket Books) and The Rules of Modern Policing (Bantam Press). He has also worked as both a designer and series consultant on a variety of part-work magazines, on brand development projects for Metrostar, Sony Pictures, and former gift-book publisher MQ Publishing.